24 Responses to How good are we at prediction? I don’t think VMT is a good way to measure transit usage, or if auto use is down. VMT may be down. But per capita ridership and the % of trips taken by transit is either stagnant or still declining in most parts the USA. So I really do question the VMT stat. People could be driving just as much now, just shorter distances, and VMT would show that as a decline. When in fact people are driving just as much, if not more than before. I often wonder why American jurisdictions do not use per capita ridership and mode share percentages more. In Canada, Australia, and Europe, this is a common way to judge if transit changes are working, and often goals are set to hit a certain percentage by a specific year. You almost never see that kind of planning in America. I have spent much of my career evaluating plans based on complicated computer models. My professional experience is in hydrogeology, but I have found that many of the same issues are present in transportation models. I come from a similar background and reading that post basically gave me déjà vu. I think we would just design based on existing conditions and community input. This is actually common practice in simple transportation projects like roadway resurfacing instead of full reconstruction. I design to existing volumes instead of 2040 projections all the time. Great post! I think you start to answer your own question a bit here. “Planning without projections” involves developing and evaluating scenarios, taking educated guesses as to their likelihood, favoring solutions that provide value under a variety of scenarios, being transparent about assumptions, methodology and caveats, and using the best, most relevant data possible. Uncertainty about the future isn’t an excuse to do nothing, nor is it a reason to throw up one’s hands and rely on old models that don’t work anymore. It’s a call to be more sensitive to change and consistently self-critical about whether we really know the stuff we think we know. Michael – I don’t really get your point(s) at all. 2. Mode share % is very hard to calculate, mostly because it depends on a lot on asking people “how did you get from A to B?” and the questioner must be savvy enough to tease out differences between “I drove” or “I took transit” and “I drove to a park-and-ride, took a shuttle bus and then walked an additional half-mile.” Since American planning agencies are woefully underfunded compared to their European or Canadian counterparts – thanks to America’s low levels of taxation – I imagine they simply don’t have the manpower to conduct those surveys that often. 3. The biggest problem I have with your post is the assertion that more people taking shorter trips would register as “VMT (showing) that as a decline.” Actually, more people taking shorter trips could show up in VMT as a rise, decline or flatline. It would depend on (1) population growth and (2) whether the existing and new people were making more trips overall to offset the fact that everyone was making shorter trips. But regardless of all that, the data clearly shows that VMT flatlined since 2003… so who cares whether the makeup of the flatline was that people are substituting shorter trips for longer ones or cutting trips completely out of their daily travel “diet”? The point still remains that, at any given moment, there are still the same number of cars using our roadways as there were in 2003… which is quite amazing and strongly suggests that people are finding other ways to satisfy their need to move about every day – i.e. taking transit, biking, walking, etc. – or are spending more time at home… both of which point to a need for highway designers to start revising downward their currently-apocalyptic projections for new highway capacity needed in 2040 and beyond. Well, in Los Angeles, transit ridership is declining slightly for the last few years despite expansion of the rail system. Auto VMT is seeing the same trend as national. I doubt we’re seeing a huge mode shift. My guess is that people are genuinely moving around less. Perhaps it’s the impact of telecommuting really starting to take off? 2005 is when I stopped going into the office every day. I’d like to think that some of this is the movement of people back in to the cities facilitation shorter commutes, etc. But I don’t know that the actual numbers on that trend hold up to the hype. Another thing I wish more folks would understand is that even if, 30 years from now, today’s 24-year-old is driving as much as her 54-year-old mom is today, we could still be in a dramatically different situation because the transition from a car-lite 24-year-old lifestyle to a high-car 54-year-old lifestyle will continue to happen later and later for each successive cohort. Millennials don’t need to remain car-lite forever to change the world. To some extent they/we already have. If you look at data from the census as well data from regions of the USA where transit usage rates are calculated, you see that transit usage is either stagnant or declining on a percentage rate. Salt Lake City for example has had big ridership increases. But coupled with population growth, it has just kept usage rates stagnant. Portland which for years has had growing ridership (until the recession hit) has actually had stagnant to declining transit mode shares. The USA I believe in 2013 has finally halted the per capita ridership decline, and it is now about flat or increased by something like 0.01% (I don’t have the figure in front of me). So growing ridership does not mean much if it is just keeping up with population growth, and not actually increasing mode share. 2. Since American planning agencies are woefully underfunded compared to their European or Canadian counterparts – thanks to America’s low levels of taxation – I imagine they simply don’t have the manpower to conduct those surveys that often. I do find data very hard to come by in many American cities, and this is something that has to be rectified. I am no expert on VTM, as the USA seems to be the only country that does that stat and promotes it so much. But I find it hard to believe there are the same amount of cars on the road as there were in 2003. I think people in many growing American cities would also beg to differ. And I think the stats showing that car use as a percentage of trips is still growing, points to otherwise. What I find troubling is the VTM stat being used as promotion that American are leaving the car behind and jumping on transit, when in fact American’s are not doing that. Except for a handful of cities, transit in the majority of America is not attractive enough to anyone with a choice to drive or take transit. And the stats coming out of these cities points to that picture, and not to a decrease in car use. So as with all stats, they can be manipulated, and I think the VTM is being overused and promoted to sell a story that largely is not happening, except for a few few places in America. I don’t know what the answer is to getting American’s onto transit. But I find it troubling that the billions spent in Salt Lake City have had almost no effect on improving mode share targets. While some simple improvements and small extensions to an LRT network in Calgary, has been able to drive up mode share targets by a good margin, in a short time. Just as an example. I reviewed a model that had a walking cliff at 1/4 mile. The assumption, based on the “rule of thumb” that people are comfortable walking “about 5 minutes or a quarter mile” had been taken so literally that it was no longer “comfortable” or “average” it was a complete barrier to generating trips beyond that distance, thus drastically reducing the size of transit walksheds. I recommended (insisted?) that it be changed so that walk trips taper off beyond the quarter mile but still exist with declining probability up to 1 mile. I regularly walk beyond 1 mile, but I admit being a freak in today’s car culture. The implications for network design are that the model with a barrier at 1/4 mile would rate things like tighter stop spacing and short deviations more favorably than frequent service. Michael, looking at VMT vs ridership vs modal share is an interesting discussion, but you’ve really got to bring some numbers to the table and acknowledge that you’re talking about total distance (VMT), total trips (ridership), and a rate with a fuzzy definition or at least hidden assumptions (modal share). All three of these have complexities buried in something that’s seemingly simple. For example, it’s my understanding that VMT as we’re talking about it is calculated excluding light trucks, which means the popularity of light trucks influences the VMT statistic even if no other behaviour changes. The best data I could find was from APTA: http://www.apta.com/resources/statistics/Documents/APTA-Ridership-by-Mode-and-Quarter-1990-Present.xls It shows total ridership from 1990-present, sorted by mode too. You can see increases generally ridership from year to year, the recent exceptions being 2009 and 2010 for the recession, but still positive over the decade and +4% from 2010-2013. So based on these statistics (admittedly rough), the idea that ridership is stagnant or declining is false. According to APTA, it is increasing. I added in some rough numbers for population, and ridership is just keeping pace or slightly ahead, but when we’re talking about modal share we’re not talking about ridership/population, but ridership/total trips, and that’s a semantic nightmare. But if the decline in VMT also means people are taking fewer trips, transit modal share could be on the rise. But people don’t exist to take trips, drive miles, or board buses. They exist to do things, and if transit and the urban fabric bring together things like shopping, friends, and jobs, people may be driving less and taking fewer transit trips, while still doing more. Coda: the one statistic most everyone can agree on is that cycling (and walking) as a mode share IS increasing substantially in North America, albeit from a minuscule base. The APTA numbers are by boarding. The numbers of boardings are increasing, but in most cities population is increasing at the same rate so per capita use or mode share is staying relatively flat. Hi Rico, you’re right and I meant to make your point explicitly – that ridership is rising at the same rate as population, and so per capita transit usage in most cities (or at least on average) is flat. But you’re conflating per capita and mode share, which are two different concepts. Mode share would be ridership / trips of all kind, and for that we need data on how many trips people take in general. It could be that people are taking fewer car trips and the same number of transit trips; that would have the effect of increasing transit mode share. My point was mainly that ridership is up, per capita is the same, and mode is hard to measure and define. An additional point to consider is that while the total automobile vmt is stable, the US population is still increasing. This means that the vmt per person is actually declining significantly. In addition, there is already a movement away from engineering cities in favor of designing cities. When you engineer cities, you treat them as systems that can be modeled to improve their performance, which is measured via numeric indicators such as LOS, congestion indices, etc. When you design cities, you develop a vision of what kind of city you’d like to create and then make decisions that support your vision. The experiment with engineering cities has been an utter disaster for the past 50 years. http://www.thetransportpolitic.com/2010/10/13/transit-mode-share-trends-looking-steady-rail-appears-to-encourage-non-automobile-commutes/ has some data on mode share, showing transit mode share falling slightly in most US cities 2000-2009. 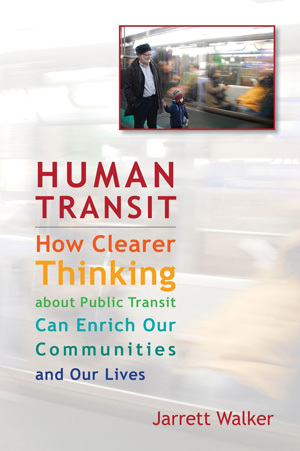 Jarrett’s post at https://www.humantransit.org/2010/01/portland-a-challenging-chart.html discusses the specific case of Portland, which despite heavy transit investment (compared to the rest of the country) saw no increase in transit mode share. Thanks for some great additional data; however, both the Portland data and the American Community 2000-2009 data are explicitly only about commuting trips to work. These are important, but can’t be used to support Michael’s original assertion about transit ridership, per capita trips, and modal share in general, unless qualified as such. I’m guessing non-commuting trips are more discretionary and so make a good starting point for increasing transit service; they are also incrementally easier to provide, because many happen outside the peak period and so do not require intensive capital spending, rather an incremental increase in operating subsidy. I think it is safe to say, regardless of the data, that transit has not made much in roads in the USA, even in the last couple years. Transit has gone great the last little while in a handful of American cities. But a side from that, even just looking at ridership numbers, one can see there is very little shift in American travel patterns. The truth is, and I did a presentation on this a few years ago. That even if the majority of American’s wanted to change their travel habits today, and drive less, they can’t. They can’t, because something like half of Americans, even in metropolitan areas, have no access to public transportation. Where they do have access, the service is often very limited, and so only captive people rely on it. People can’t walk places more, because most live in areas with no pedestrian amenities or places nearby. So the USA has a lot of work to do, and we can’t expect a shift in travel, if the alternatives are not developed and easy to use. What I find troubling, is that even in cities where substantial transit expansion has happened, transit usage rates are not improving, or improving very little. And yes we need more data. But the data we have still points to transit not capturing much of an increase. What really troubled me, was I just finally thought about the APTA numbers about US ridership going over 10 billion rides for a year. That 10 billion is unlinked trips, which is how most of the US counts transit ridership, but not how other places like Canada do. So the unlinked number inflates the actual number of trips taken, and so the US stats are actually worse than people think. I am curious as to the influence on the evident flatline in VMT since 2004 that the plateau and decline in the world supply of cheap conventional oil had. The price of oil effectively quadrupled since the turn of the century and seemed to pull relatively quickly out of the second deepest recession in history, this reflecting a collision between supply limitations and rebounding demand. The timing of both does seem to dovetail well. The price at the pump is one of the best indicators of driving affordability, which reasonably correlates with VMT. The cost of producing unconventional oil (shale, deepsea, tar sands …) appears to be underwriting the current price which is has been hovering above $100 a barrel for several years (i.e. the world price, or Brent index). The trouble with these sources is that they are increasingly unreliable. Tight oil and shale gas, for example, have extraordinary annual production decline rates and the big five US shale formations are thus set to slide into permanent decline before 2020, according to independent geologists like Arthur Berman and David Hughes, both of whom use actual evidence to regularly demolish the published hype about shale. You have to drill a lot more expensive wells and frack more numerous and less productive formations beyond the already-tapped sweet spots just to maintain flat production levels, that is, until you reach the ultimate geological limit. The tar sands have their own well-defined limitations on production, such as huge inputs of energy and water used for processing. Deep water drilling is getting ever deeper and less productive, and more expensive. Further, the net energy from these sources is measurably less than the net energy from conventional oil, and the environmental repercussions are well-known. War and terrorism have a direct and immediate effect on the price at the pump. Then, of course, there are the increasingly apparent costs of climate change, and mounting pressure on decision makers to do something about it, a task in which their collective performance has been utterly pathetic so far and rife with “it will destroy the economy” rhetoric, as though spiking fossil energy prices won’t. Given the evidence, the price of fossil fuels must inevitably climb even higher in future, perhaps in spikes, and could hit an affordability ceiling that will likely impact not just VMT, but the entire economy given the saturated dependency on this finite energy source. I don’t think anyone reading Jarrett’s blog needs an explanation on how that will influence transportation. Other influences on VMT could include Boomers on the leading edge who are now retiring, leaving more of the economy to Gen Xers and Millennials who seem to have a healthier urbanist influence and therein drive less. There are also fewer of them, hence fewer drivers. That is a very good point. For example, downtown Vancouver is situated on a peninsula that experienced a ~20% decrease in road traffic during a period when the population virtually doubled and a new subway line was built. This is an actual measurement, not a statistical projection. Before the planning initiative in the 90s that encouraged a large increase in population growth downtown along with the accompanying service industries, about 40% of residents historically never owned cars. It’s obvious that trend continued (well, if they own cars they are leaving them parked in the underground), and that the majority of people there prefer walking and hoping onto transit. Downtown Vancouver has the highest residential density in Western Canada and remains the largest employment centre in the province of British Columbia, and is well-serviced by transit from the rest of the region. These have no doubt influenced VMT in the city, but probably not half as much in the suburbs. Vancouver is doing some great things, and has increased their transit mode share metropolitan wide. While gas prices influence people, I don’t think you see as much of of a change in habits as we might think. The fact is, if transit is a viable option, a lot of people already take it. And high gas prices are not going to make someone all of a sudden take transit, if the service is not attractive, unless the person is really feeling it at the bank. We have to put out a good product, and not expect high gas prices or other outlying influences to get people onto an unattractive service. Vancouver, Calgary, and other cities are attracting mode share to transit by putting out a good product, coupled with policies to encourage alternative transport modes. Kingston, Ontario, a small city of 100,000 in the great region, and about 55,000 in the core area, has just started limited stop express bus service. In this city where traffic and parking are not really issues, they got a 14% increase in ridership from the start of this limited stop service. Early results show that people working in the hospital, downtown, and the university are leaving their cars at home and taking the bus, because the bus now offers a competitive trip. Kingston already offers better transit service frequency and coverage than many American cities 20 times Kingston’s size. That’s a great example Michael, I live in neighbouring Toronto and didn’t know plucky little Kingston had limited stop bus service. Setting aside statistics for a moment, I think the greatest opportunity for increasing transit modal share comes from express or limited stop bus services that are well-branded, easy-to-use, and frequent. I was living in Hamilton, ON when they introduced the B-Line along the main east-west thoroughfare, I know the Kitchener-Waterloo region has the iExpress (with an LRT on the way to replace it), and from what I can tell York Region’s and Brampton’s (municipalities north of but contiguous with Toronto) Viva and Zum services have been a great hit. That is stranded somewhere between an oxymoron and mauvaise foi. Every plan depends on a vision of the future. It can be a single outcome that you weight at 100 per cent or it can be probabilistic. Then, you can make your vision of the future explicit or implicit. As bad as those VMT projections are (I suspect the public versions are just mid points of predicted ranges), at least they were made public so that, ex-post, we can learn from them. Remove projections of the future from your plan and the public is forced to infer what they are from the plan itself. “The truth is, and I did a presentation on this a few years ago. That even if the majority of American’s wanted to change their travel habits today, and drive less, they can’t. In the short run, if there is no public transportation and people want to switch to public transportation, people keep driving. But in the long run, people *move to cities which have public transportation*. And there are so many options! There are dozens in China alone! There are even a few in the United States! It’s probably too soon to see a large trend in migration patterns between cities based on availability of public transportation. (Although Detroit is already obvious.) *But you can already see the trend in land prices* in pretty much every city; land near public transportation is way more valuable. This means it’s more popular. This will show up in migration patterns sooner rather than later. Land use is the difference there. Salt Lake City is zoned for auto sprawl, and the auto sprawl has continued. Calgary allows for (and even encourages) urban development, and the urban development has happened. Home › Access › Meditations › Philosophy › Technophilia › US Federal Policy › Values › Words, Unhelpful › How good are we at prediction?